The magnets in the back of the picture tube were not always aligned properly, which meant edges of the image were cropped. As a TV set got older the magnets would slowly zoom into the center of the image, a process called “pin-holing,” causing increasing portions of the image around the edge to get lost. Even today, we still need to pay attention to these issues because not everyone has yet upgraded to an LCD TV set. And, when you are digitally projecting an image, overshooting the edge of an image is common. So, to help us prevent having portions of our image – like the phone number of a sponsor – disappear because the edge is no longer visible, all versions of Final Cut and Adobe Premiere allow us to display two boundaries to help us align our images. This makes sure that essential portions of our image can be seen on virtually all TV sets. Action Safe: This boundary is 5% in from each edge of the frame. All essential action, and actors, should be inside this outer boundary. 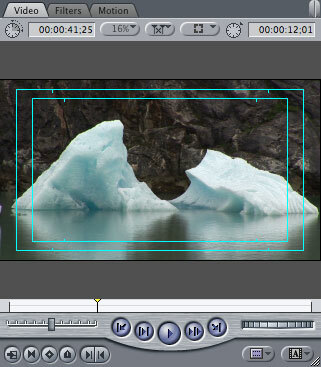 Title Safe: This boundary is 10% in from each edge of the frame. All essential text, logos, graphics, and titles should be inside this inner boundary. So, now that you know what these are, how do you display them? 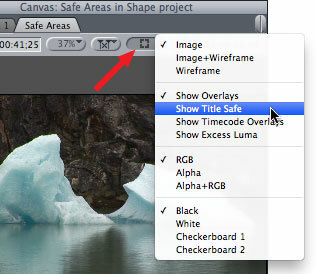 Click the Switch in the top right corner of the Viewer and toggle Show Title/Action Safe Zones on or off. 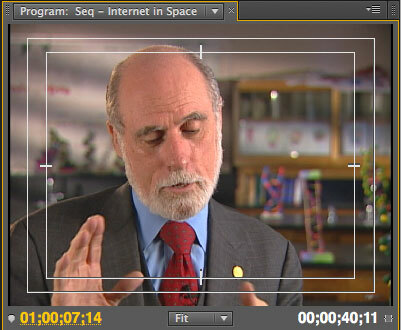 In Final Cut Pro X, the boundaries are shown as yellow rectangles. Action Safe is the outer rectangle, Title Safe is the inner rectangle. From the popup menu in the top right corner of either the Viewer or the Canvas, select Show Title Safe – this will toggle the display of the two rectangles either on or off. Select View > Show Title Safe. 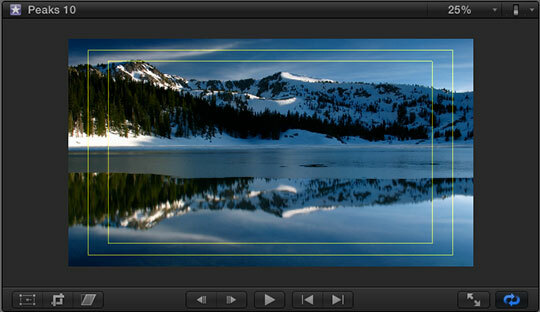 In Final Cut Pro 7, and all earlier versions, Action and Title Safe are displayed as cyan rectangles. 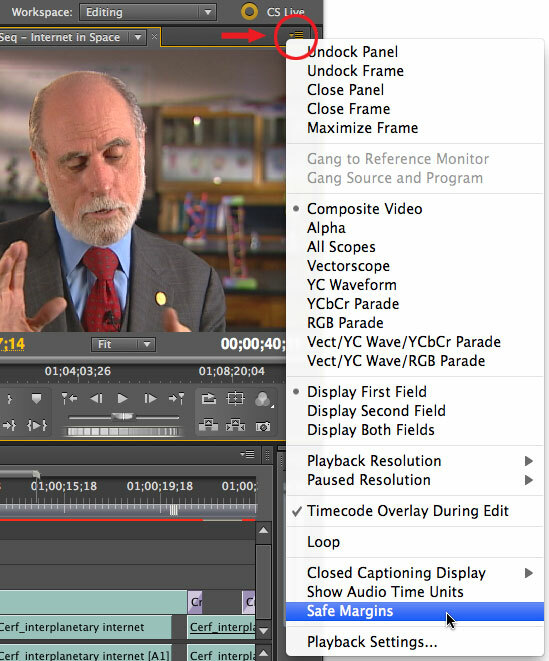 In Premiere Pro, click the small fly-out icon in the top right corner of the Program monitor and select Safe Margins. In Premiere, the zones are displayed as white rectangles with a small hash mark indicating the vertical and horizontal centers of the frame. These boundaries are essential for any video going to DVD, cable, or broadcast — in other words, anywhere except the web. However, I’ve also found that these boundaries are useful for web video as well. We’ve grown up watching video that honors these boundaries, it is ingrained in how we perceive television. Text that touches the edge of an image creates a very uncomfortable feeling in the viewer; generally, this is something we want to avoid. So, when I’m creating video for the web, I don’t need the excess protection that Title Safe affords. 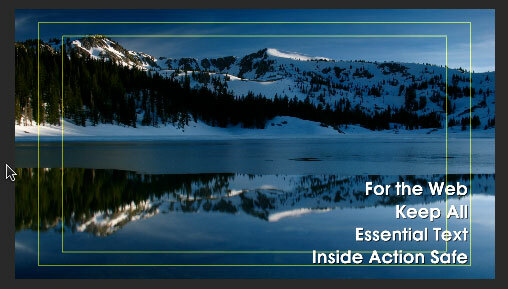 Instead, I frame all essential text, logos, or composites so that everything is contained inside Action Safe. Thanks Larry. I having trouble with newspaper clippings and the headlines being cut off on some TVs. I’m checking it after applying the Burns effect using action safe zones. It would be helpful if there was a safe zone option that could be displayed within the Burn guidelines. And to make matters worse, TVs seem to vary–an LG LCD seems to have a different mask than a Sony LED. Also, TVs have always added contrast to my work, which frustrates color correction. If it cheers you up, ALL TVs have varied since the beginning of time. That is why Action Safe was invented in the first place. Misery really does love company. One other issue is figuring out how to correct for a particular projector. You helped me one time by email with regard to an anamorphic feature I cut for a guy. We still have to reinvent the wheel to get that onto a DVD, but when the DVD is projected, the aspect gets messy. Now that we’re exporting to Blu-Ray, hopefully, those problems will lessen somewhat. Thanks again for your wonderful tutorials. My son made a movie on his camera of a butterfly emerging from the chrysalis. (he downloaded the movie to my computer.) I am trying to use Adobe Premiere Elements so I can make a DVD of his movie. Sometimes the action is not within the safe margins. I don’t understand how to fix that. Can I just move the picture until it is right? Not sure if you’re still checking this post for comments, but I was wondering what the repercussions were of putting titles slightly past the title-safe borders, but still within the action safe borders. Now that I’ve produced several commercial ad spots for broadcast (with no problems) I’m very keen on noticing other commercials. None that I notice seem to follow the title-safe guideline. They all seem to have text that’s well beyond where I would think the title-safe border would be. It just makes me wonder how necessary the title-safe border is in comparison to the action-safe, and especially so in SD commercial spots. I’d be interested to know your thoughts. You are making an assumption here. And that is that everyone has the same TV you do. If that’s true, then, yes, you can exceed title safe boundaries. However, that isn’t true. There are still people watching TV on CRTs, as well as LEDs. Ask yourself this: What’s the risk if someone can’t read the entire phone number or web address? If that isn’t important, you can put it wherever you like. If it IS important, then erring on the side of caution is critical. 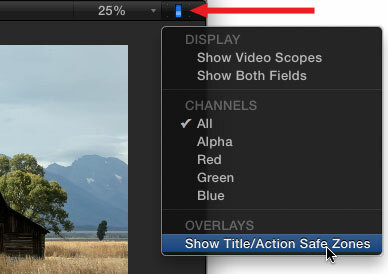 Also, for videos designed for the web, I put everything at Action Safe. For videos designed for broadcast or cable I put everything at title safe. It may be conservative, but no one has ever complained that the audience couldn’t see the logo or phone number. Thanks for getting back to me, Larry! I don’t mean to assume at all. I just wish I could see the real time effects of exceeding the title and action safe boundaries. Since I know it’s impossible to see what every viewer is seeing (and since I don’t have an external NTSC broadcast monitor) the title/action safe guidelines are all I have to go by. I’ve never seen one of my commercials on television, so I’ve always wondered what they could look like on different television sets. I’m just curious how other video professionals work within the title/action safe guidelines without compromising the aesthetics of their final product. As I said above, it seems to my naked eye, that a lot of commercials I see on TV go way beyond title safe boundaries. Maybe this is because they’re running on a specific broadcast stream, or maybe its my TV. Thanks again for your feedback, Larry. I really enjoy your site! Great article! I also always use the action safe for titles and logo’s. If I Don’t, I feel like my eyes all of a sudden have to ‘zoom out’ to read what the text is saying, which feels a bit uncomfortable. You can’t change the default setting. FCP X will always restart with Safe Zones off. However, you CAN create a keyboard shortcut that enables them with just a key-press. – from title safe to an area well above (equal in size to Edge + Action Safe + Title Safe) your captions will appear, based on a two line caption. Any text is obscured in this area, such as name, title etc or intro text. Do you account for this when you develop video? Do I account for this? No. Should I? Yes. Hey Larry- Great info as always. I am office cleaning. Is the STILL (2017) reason to keep this lunker of a CRT monitor? Well… the good news is that its paid for.